Our State Street, Chicago officials pondered in the 1970s, was getting badly beaten by North Michigan Avenue—and suburban malls. How could we compete? Their answer was an insider design for a new streetscape: widened sidewalks, asphalt pavers (does anyone remember those ugly hexagons? ), anti-crime lighting, and a bus-only mall. Foot traffic withered, storeowners hated the changes, and five of the original seven big stores closed. Stumbling into the 1990s, city officials realized they needed to hire a pro. 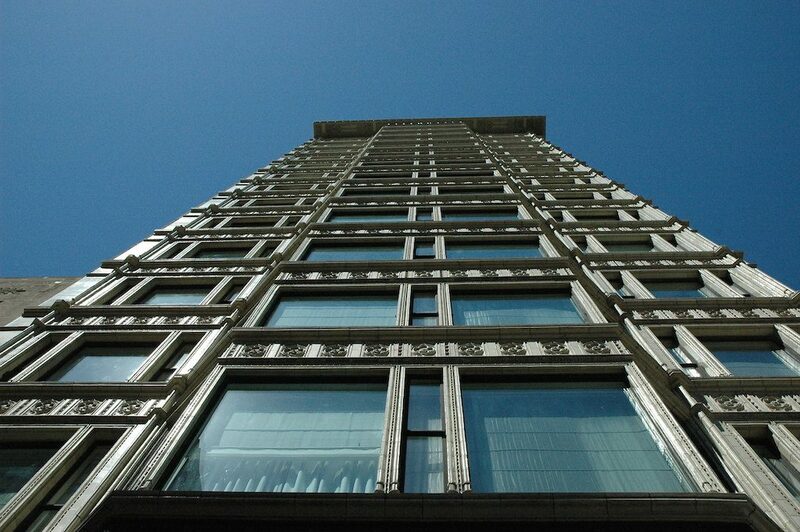 That was SOM (Skidmore, Owings, and Merrill), a Chicago architecture firm with heavy urban-planning experience. Intrusive old subway entrances were replaced with glassy, low-profile kiosks. Period “street furniture” and lighting matched the elegant old street walls. Private traffic returned, pleasing storeowners whose car-borne shoppers now had unobstructed views of window displays. Designers of the new planter fences had some fun with our city’s name. Look for sprouting bulbs in the tracery—wild onions had proliferated here in local marshes. (The Indian word for them was, by legend, pronounced she-ca-go.) Look again: Was it by chance or intent that the famous “Chicago window” is in the fence, too? Note the onion and “Chicago window” details in this planter. Changes wrought by SOM and Mayor Daley II set the stage for what’s happened next. Heroically, the School of the Art Institute began recycling old office buildings into dormitories and classrooms. Round-the-clock activity sparked a boom in cigarette and hair color sales. Millennium Park opened in 2004, spurring the so-called “Millennium Park Effect” with its condo boom. Young and old moved downtown as never before. Let’s stroll, keeping an eye open for interesting details. 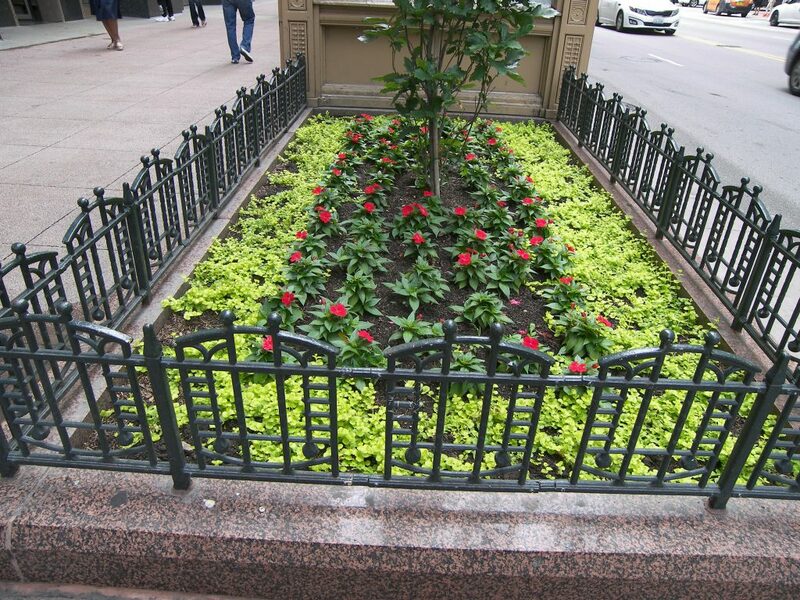 We’ll start at State and Wacker, the northeast corner at the river. The Art Deco bridge tender house was designed in 1930, finally built after World War II, when the bridge itself was dubbed the Bataan-Corregidor Memorial Bridge, in honor of those who served in the Philippines. Notice the west-facing sculpture shows the “first bridge” with a sailing vessel passing an historic center pivot bridge. The south panel shows a freighter under modern raised bridges. The bridge tender house at the Bataan-Corregidor Memorial Bridge. The building’s residential floors are raised on two “stilts,” so that even the lowest apartment has a clear view of the park and lake. 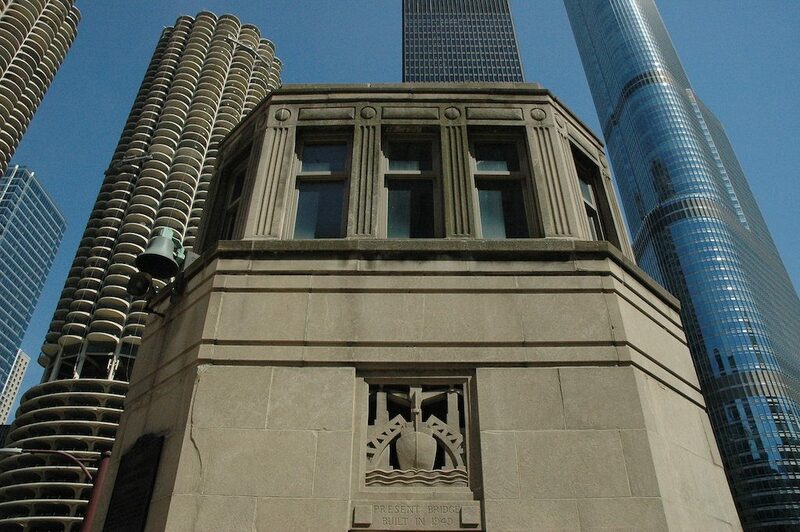 On this site until 1939 was Burnham & Root’s 1892 Masonic Temple—briefly the world’s tallest building. That title went to New York until the Sears Tower opened in 1974. The entire block south of Randolph Street belongs to Macy’s, née Marshall Field & Co. That colossus—for many years the world’s largest department store—was designed in three stages (1893-1907) by Burnham’s firm. An enormous Tiffany mosaic crowns the southwest interior. The Reliance Building, now the Burnham Hotel. 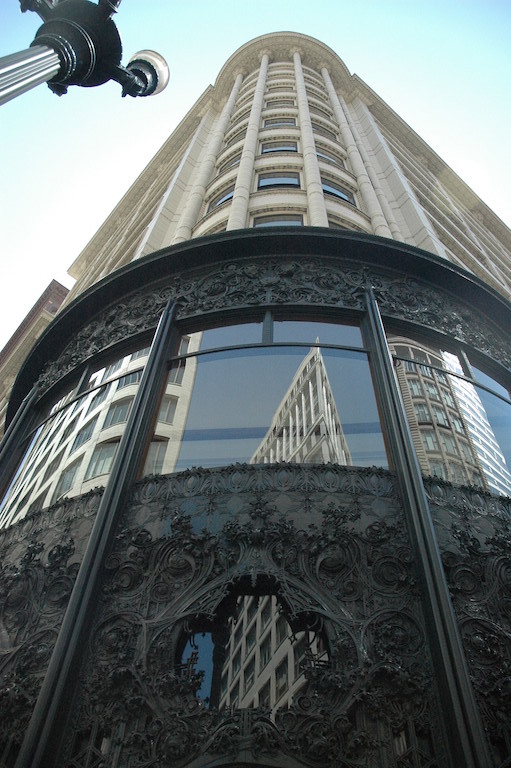 The nearby Reliance Building (1894), vacant for decades, is now restored as the Burnham Hotel (Charles Atwood was Daniel Burnham’s principal designer, hence the Atwood Café). Friendly hotel staff may permit a peek into the elevator hallway to admire the original floor, how the elevators looked in the 1890s, and to see some before-and-after photos encased on the wall. The Reliance’s creamy glazed terracotta cladding and oversize windows to favor natural light made it a perfect place for dentists. After an appointment, your teeth might look milky white. Buildings clad in glazed terracotta, cleansed by rain, stood out among stone-clad neighbors in that coal-burning era. Where State meets Madison is address zero (N/S) and zero (E/W), the hub of the city’s numbering system. At the southeast corner stands Louis Sullivan’s 1899 Carson Pirie Scott & Co. department store, now called the Sullivan Center. When most stores had mid-block entrances, Carson’s attracted shoppers with Sullivan’s dramatic geometric/organic cast-iron “foliage” at the corner of what at one time was the busiest intersection in America. Sullivan’s Carson Pirie Scott Building. 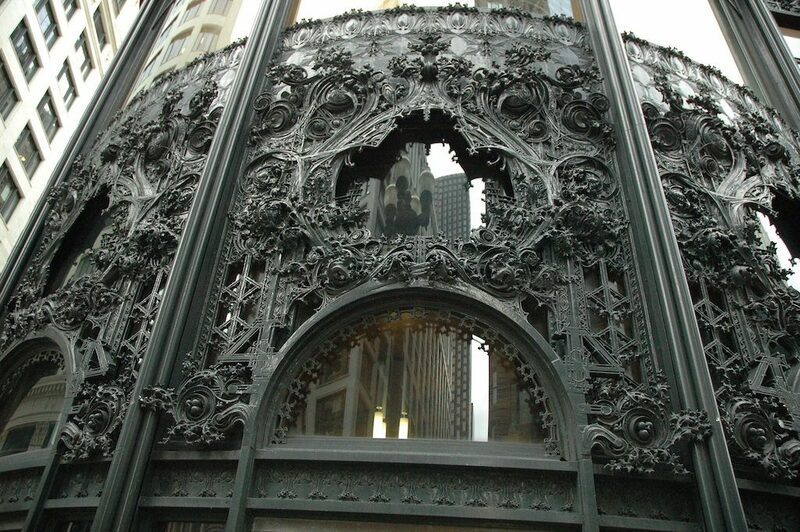 Carson Pirie Scott entrance detail. Louis Henri Sullivan’s initials are proudly cast in the tracery above the entrance. While the corner ornamentation tends to overwhelm the eye, side windows are framed like pictures, which encourage a focus on what’s inside. On the Madison Street side, what looks like an elaborate theater entrance suggests that a theatrical experience awaits the incoming shopper. 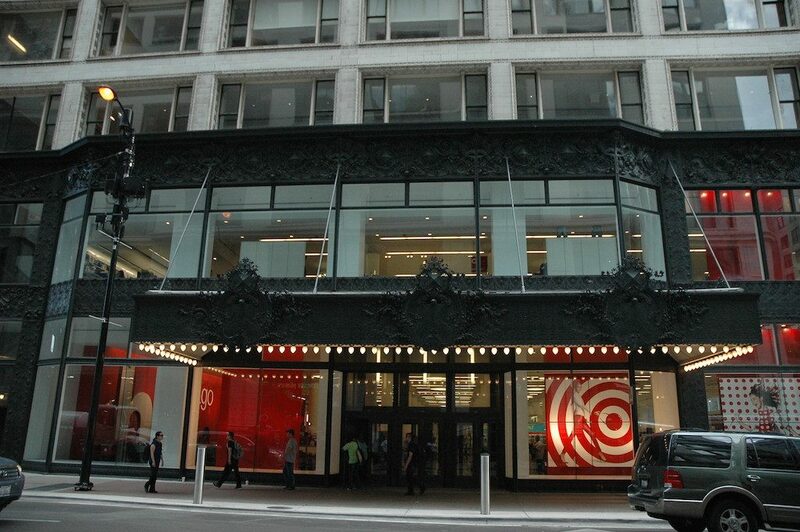 The theater entrance to the Carson Pirie Scott Building. 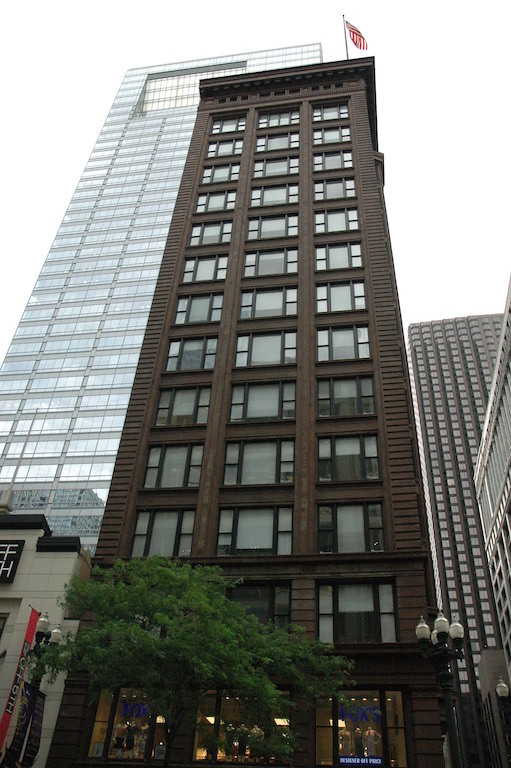 Across State Street is the 1904 Chicago Building. Its stark façade highlights the “Chicago window,” which we’ve seen echoed in the new planter tracery, with its fixed center pane between two movable sashes. It is one of the first of many conversions from failed office building to Art Institute dormitory. For decades, its lower level was home to a favorite of Chicagoans: Le Bordeaux restaurant. The Chicago Building (1904), now an SAIC dormitory. Let’s end our stroll at the Palmer House at State and Monroe. The third Palmer House on this site, it’s the oldest continuously operated hotel in the U.S. Bertha Palmer, head of the Ladies Board at the World’s Columbian Exposition, asked a chef to come up with a new kind of dessert to accompany their boxed lunches. That 1893 invention became known as the chocolate brownie. 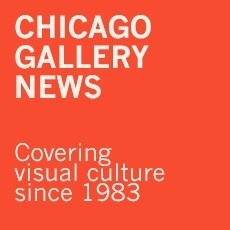 This entry was posted in Chicago Architecture on July 9, 2017 by Kay Whitfield.